Chia Chen leads the mobile practice for Digitas in North America. He was recently appointed to that post after leading critical support of American Express’ digital business. As head of mobile, Chia Chen consults across the Digitas network of clients that includes Delta Air Lines, General Motors, P&G, Kraft and TIAA-CREF. 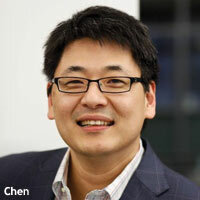 OMD recently talked to Chen about his group at Digitas and what’s happening in mobile marketing at the start of 2012. OMD: Can you briefly explain Digitas’ overall approach to mobile? Chen: We’re in the post-PC era of digital, and mobile is the primary way people are connecting to digital. We believe we’re on our way to becoming the first post-PC digital agency. We see a day where that’s going to be the model. So your Web team is going to be thinking about all these different screens at the same time as they think about the Web site. It's got to go beyond targeting segments. We need to figure out how to identify moments in people’s days where the brand can make sense. For example, we created a program for Buick called Moments of Truth, with people giving testimonials of their fairly unvarnished experiences with the Buick cars. One thing we’ve noticed is people are very engaged with content on tablet devices, so we optimized that experience for tablets, and it surpassed all our expectations. OMD: What’s the difference, if any, in how clients view mobile marketing compared to a year -- or two years -- ago? How is that reflected in mobile budgets? Chen: Two years ago, clients knew it was the future. Anything they would do in that space would be more for PR value than marketing or business results. What’s really changing in 2012 is that they’re really integrating mobile into how they’re thinking about digital and how they solve their marketing challenges. They’re definitely increasing their investments from a paid media perspective overall. OMD: Is the amount allocated for mobile in digital budgets growing? Chen: We’re definitely seeing budgets move to mobile. In many instances, that move comes at the cost of something else. What certain clients are doing is making the portion of the digital budget that is mobile a lot higher than the previous year. Chen: It ranges anywhere from 20% to 150%. If you look at our top clients, they’ve all increased the proportion of their investment allocated to mobile. There are clients, of course, who are still going to be slower, who are still in an exploration type phase. OMD: With Apple lowering the minimum buy for iAD from $500,000 initially to $100,000, do you think more brands will launch mobile campaigns, if they haven’t already? Chen: It’s definitely good for Apple because it will drive more people to test the property or that network -- the iA -- because half a million dollars, or even $300,000, is still a pretty big chunk of that [mobile] budget. That said, it’s only going to indirectly help paid media in mobile because it doesn’t really address some of the issues that still persist. Chen: Issues like having some standardization in terms of ad formats and innovation in that space. Right now, if I’m going to do a rich media ad unit, I have to develop it for iAd or Celtra or Phluant -- any of those kind of platforms -- I’ll have to redevelop for each, which is a little painful. Not having a single ad-serving kind of infrastructure, like a DoubleClick or Atlas in the desktop world, is a little tricky as well. You’re not able to get consolidated reporting. 1 comment about "Digitas' Chen: Mobile Is Prime In Post-PC Era". Mark Stroman from McGhee Entertainment, March 2, 2012 at 11:59 p.m.
Chen is "on it". Mobile is the new frontier and the most exciting ad space to be exploring now. His comments are spot on, and the issues he raises are the real deal. The Mobile world is the new remote control for the rest of our lives. Who wouldn't want to invest in that?